This page describes 2 PCB layouts using the THB6064AH. These were developed to offer a DIY solution for people who want to use this chip. The THB6064AH (sometimes also called TB6564AHQ) is a "customer chip" made by Toshiba. It's a high-performance dual H-bridge bipolar stepper motor drive chip. Powerfull motors can be driven with it's 50VDC maximum input voltage and 4.5Amp peak current capabilities. It does not require the TB6560's power-up initialisation sequence wich causes it to blow occasionally, this new chip has been evaluated and tested by several people and has proven to be extremely reliable. PWM chopper-type sinusoidal micro-step bipolar stepping motor driver IC. It supports 8 kind of excitation modes. Low-vibration, high-performance drive of 2-phase bipolar type stepping motors using only a clock and direction signal. - a traditional one where the chip is standing upwards, this one has an optimal design to obtain the best quality and performance, no compromises on component selection. See top left picture. Input Voltage up to 50VDC ( 40VDC recommended). Current per phase up to 4.5A peak. Automatic current reduction at standstill. Optical high speed galvanic isolation. On board high voltage input power regulator. Can be used with 4,6 or 8 wire motors in bipolar configuration. 8 microstep modes, jumper selectable: 2, 8, 10, 16, 20, 32, 40 and 62. Chip has built-in thermal shutdown and over-current detection. 10 pin Box header for signal flatcable providing compatibility with PMinMo standard, USB CNC, Planet CNC, and others. 6 pin pluggable or screw terminal connector for motor and power connections. Motor current can be set to any value by adjusting a quality trimpot, no jumpers or limited current setting modes. Double sided professional PCB with soldermask, silkscreen and plated holes. 2 Led indicators, one for power and the other for alert. 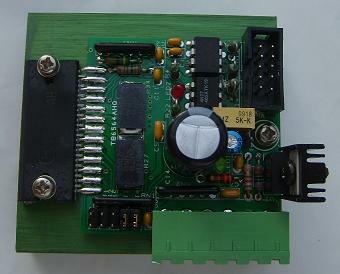 - Larger PCB (50 x 100mm). - 4 current sense resistors to reduce their power and heat dissipation. - Amplifiers on the output signal of the optocouplers, this will allow the drive to function properly with low current input signals. - Seperate ground plane for signal and power. 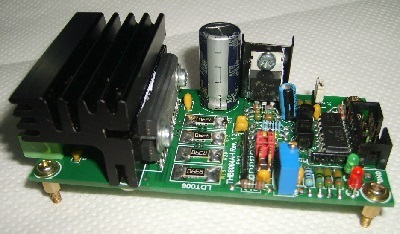 - On board space for voltage regulator heatsink. - On board space for THB6064 heatsink. - Easy mounting with 4 fixation holes in each corner. - Smaller PCB (50 x 50mm) reduces cost. - Driver chip is located outside the PCB for easy mounting on the heatsink. - Fewer or combined components further reduce cost. - 2 current sense resistors. - Unlimited heatsink size for easy chip cooling. Pictures, schematic, PCB layout and assembly instructions are available under the respective tabs. On offer are the PCB with the THB6064AH chip, an option kit with the critical components and for those who want it real easy with no hassle: there's also a full kit available. Last modified on 13 july 2015.